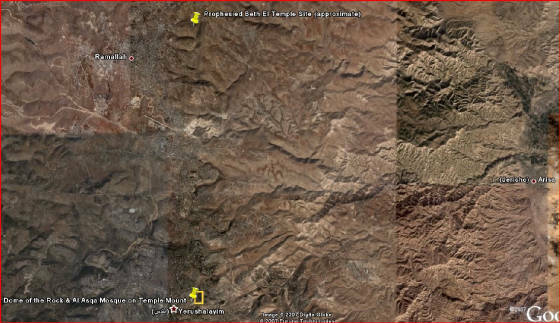 Photo below from Google Earth shows historic site of first two temples below and the prophesied site for the next temple above. Thus, when these identities are firmly established in one's mind, one readily understands the prophecy of Ezekiel (Ezekiel 39:2) wherein a remnant of one-sixth of Gog will survive and be brought from the north to the mountains of Israel. This is the extermination of the Ashkenazi Jews at the hands of the Nazis and the Zionist emigration out of Europe into Palestine, which is commonly mistaken for the ingathering, or the prophesied return of the House of Judah and the House of Israel to the Holy Land. For more information see http://www.show-the-house/id55.html.